You know the story of the little boy who cried wolf. Sue Parker finds herself in the same position, and pays the price for her over-active imagination that is fuelled by too much television. She just spins tall tales for a little excitement in her dreary village, despite its name – Fame. But of course Sue gets more excitement than she bargained for in her story. And when Sue finds it is turning into something even more evil than mere excitement, it escalates even further because nobody listens to Sue, as she is known for her crazy imagination. It all seems to start innocently enough, with promises of real fame for the village of Fame. Major Grenfield rents out the old manor to Mr Grand of IBC TV studios. Grand wants to film a festival in Fame, with snobby Angela Grenfield as festival princess. But Sue overhears his employees saying that Grand has something far more exciting planned. Sue’s imagination goes into overdrive as to what this means, and starts getting ideas about spies. In a way it does turn out to be spying – Grand wants to start filming day-to-day lives of the villagers. So there is going to be real fame for the village of Fame, with the villagers all thrilled at being TV stars. But Sue is not keen on cameras being installed everywhere in Fame, and she does not trust Grand. And of course, Sue’s suspicions prove justified when she discovers the lengths that Grand will go to with his publicity stunts to increase ratings. He starts by provoking Sue’s family to quarrelling in front of the cameras, but is soon moving to more devious tactics when Sue declares war on him. Among them, Grand plants his niece, Mandy Walters in Sue’s school, who at first pretends to be sympathetic to Sue. But Mandy turns on her uncle when he does not keep his end of the bargain. So Mandy tells Sue the truth, and they become reluctant allies, with Sue not fully trusting Mandy and Mandy still having an unsavoury disposition. But Mandy has a conscience too. She discovers it when she gets scared by what her uncle does next, and she and Sue become true allies. And what does Grand do next that frightens Mandy? He hires a sinister hypnotist named Marvo to help him jack up publicity even more. One look at Marvo, and you can see why anybody would be frightened. 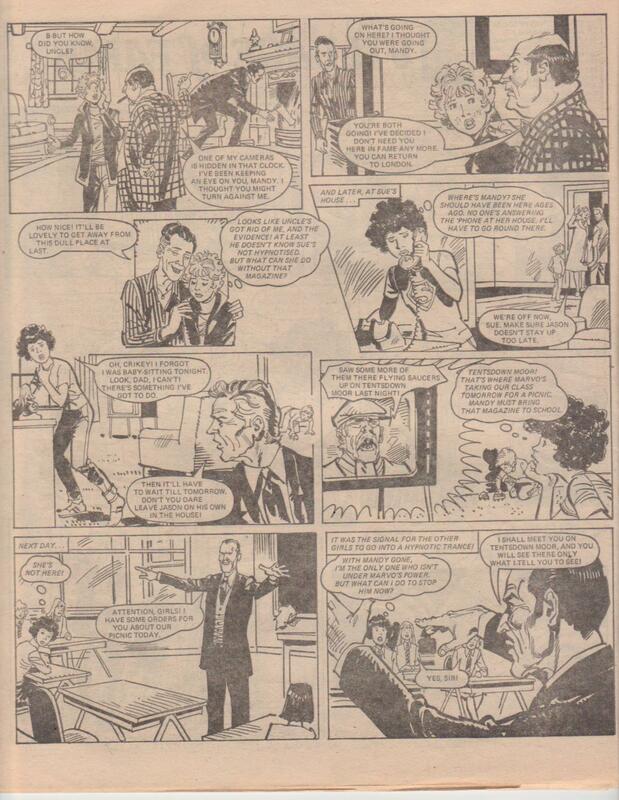 Marvo becomes Sue’s teacher (after Grand contrives to get the previous teacher sacked) and hypnotises the class into doing things, such as make them disappear on a picnic and blame it on flying saucers. But nobody listens to Sue’s warnings about Marvo and Grand because of her reputation for too much imagination. Mandy, the only person who can help Sue, has been sent out of the way. So far we have spy cameras, publicity stunts, frame-ups, attempted kidnappings and a hypnotist, all in the name of higher ratings and money – what’s next? Blackmail, as it turns out. Grand had been blackmailing Major Grenfield into renting out his manor for the TV serial. 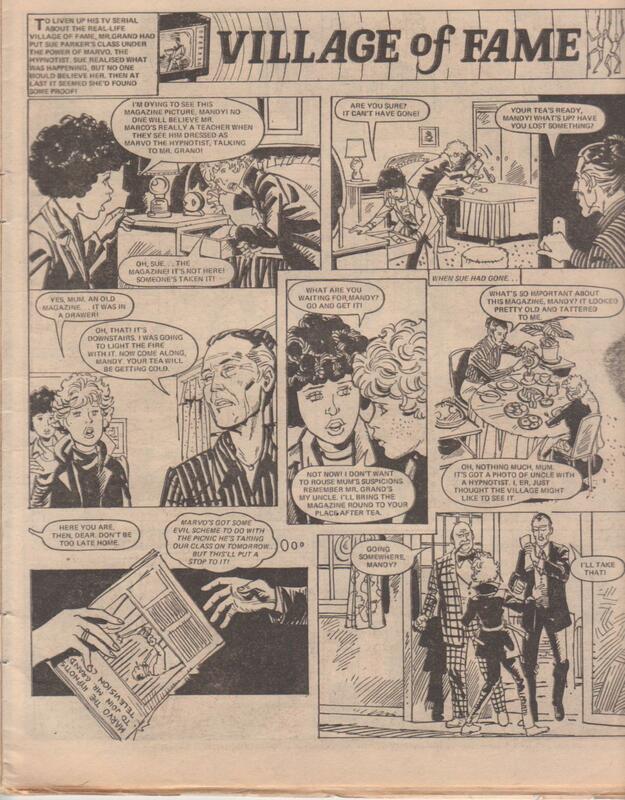 And thanks to a secret passage, Sue, Mandy (now returned) and Angela overhear Marvo and Grand talking about another plan that will make his serial unstoppable (it has taken a dent because the Major is now speaking out against it). This turns out to be mass hypnotism of the entire village – brainwashing everyone into saying, “This serial is good for Fame.” Sue foils the brainwashing, and everyone now realises that Sue had been right all along. Soon it is cancellation time for the TV serial and jail for its creator. But not before Angela, Mandy and even Marvo almost die because of it. It is not difficult to see why this is one of Jinty’s most well-remembered serials – it pushes so many buttons in the human psyche. Dreams of fame, imagination, fantasy, greed, money, conspiracy theories, paranoia, manipulation, brainwashing, publicity stunts, and intrusiveness of technology are just some of them. And there is the television theme. 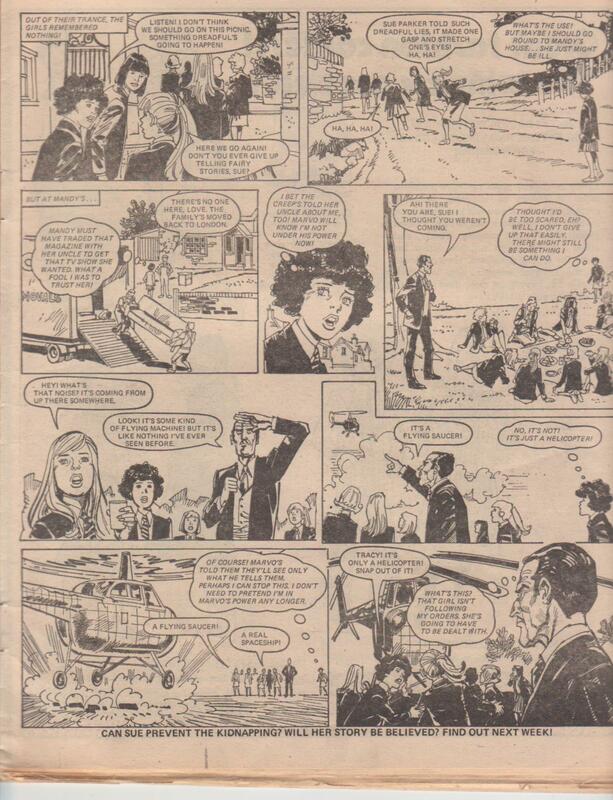 Television stories are very popular in girls’ comics. Who doesn’t want to be part of a TV serial and dream of fame on television? But television is also known as the one-eyed monster, and there is a definite take on this and the evils of television in this story. First we have the television cameras everywhere, watching every move that everyone makes. But the spy cameras are not just intruding on people’s lives; they are also manipulating them and passing on information about them to the master control. An insidious presence that is creepy because you cannot see who is behind that camera, but they can see you, and heaven knows what they are going to do about it. And you cannot escape it because it is everywhere, all over the entire district. Big Brother is watching you! This theme will be seen again in Tammy’s “Tomorrow Town”. The year of 1979 seemed to be a big Jinty year for stories on hypnotism and brainwashing, and not just with this story. There was “Prisoner of the Bell”, where an underachiever is hypnotised into doing her homework. But the most remembered of these must surely be “Children of Edenford”, where an insane headmistress uses drugs to turn her entire school into glazed-eyed zombies. But she doesn’t stop there – like Marvo and Grand, she moves to bigger things by using her power to bring the entire district under her control. And that is only the beginning for her, and, presumably, with Marvo and Grand as well. After all, what is to stop them using their hypnotism to brainwash every single viewer in Britain? Our heroines, of course!